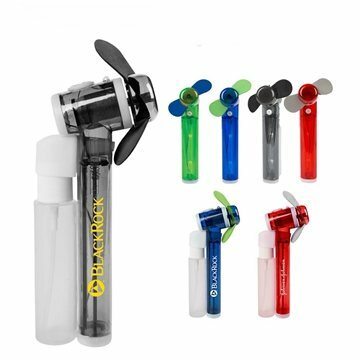 A compact, sleek, hand-held, misting fan. Easy to carry and great for traveling or while out exercising. Holds 2oz. of water for approximately 300 sprays. It was exactly what I was looking for plus I got great service from Veronica. Thanks again! they all loved it and it was a great way to remember our fundraiser. The selection of colors seemed to be great. Love the load and feel within the hands very comfortable.... The imprint looks great. And thank you very much for your excellent sale prices and I wish to again thank Veronica for letting me know when you are having these wonderful sales. Loved the price and quality so much, asked Rosa (our AnyPromo rep) to let us know when this deal comes around again. Engraving was done perfectly. Very satisfied with our order.